For a winemaker, patience is indeed a virtue. Friendliness and a willingness to share knowledge certainly count, and that's great if you're coming for a visit to our winery. Where else can you take a tour of a winery and have the opportunity to speak directly with the winemakers themselves? "Crazy" Tom didn't originally plan to be a winemaker, but his training and 40-year career as a pharmacist certainly helped prepare him for his current position as "Doctor Wine" of Thistle Meadow Winery. Tom's skills as a wine mixologist are legendary in the hills of North Carolina. Tom first began making wine after a visit to Victoria, British Columbia where he discovered the art of making wine at home in small quantities. Over the years, Tom has made hundreds of batches of wine, and he's an expert at tweaking a wine to fit the most discriminating palate. His favorite wine to drink is Beaujolais, because he says it's good for the heart. Tom lives just up the road from the winery in Laurel Springs with his wife Nancy, near the old family farmhouse that has been in his family since it was built in the 1890's. 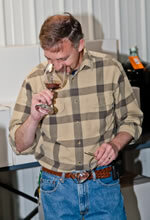 One of Thistle Meadow Winery's winemakers is Don Mabe. Don is a lifelong resident of Laurel Springs and has been a member of the Laurel Springs Volunteer Fire department for 6 years. He is also a Medical Responder. Don has one son, Brian, who is a police officer in Sparta, NC. Brant, who is Tom's son, has been making wine since 1998. He currently acts as Thistle Meadow's winemaker in charge of quality control. 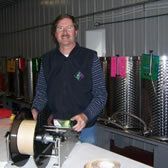 He has made wines from fresh fruit (grapes, blueberries, strawberries, etc. ), grape juice concentrates, frozen must from California and Chile, and even vegetables (garlic or jalapeno wine, anyone?). Before turning pro in 2012, many of Brant's wines have won medals in the WineMaker Magazine's annual winemaking competitions, which hosts the world's largest amateur wine competition. He also helps troubleshoot wine problems for customers of grapestompers.com. Brant is married to Amy, and they have two daughters, Ashley and Mary Beth.